I omitted the tomato and added more spinach just based on my preference. Was a really excellent dish! Very tasty. Awesome! I cook a great many boneless, skinless chicken breast recipes in the hopes of finding ones to add to my normal rotation that are tasty and relatively easy to make and rarely do I find one like this to add to the very top of the list. Thank you so much. Only changes were a smaller portion and fresh garlic and roma tomato instead of powder and sundried. Made this for a dinner party. It was easy to prepare and recipe was easy to follow. Definite will make again. Thanks so much for sharing this recipe. It’s easy and delish-definitely restaurant quality. To serve with pasta, would I double the heavy cream broth ONLY? I must have done something wrong; it tasted good but was curdled. What did I do wrong? Glad I wasn’t serving to company. Hi Pam. It can happen if the cream you’ve used it low in fat or, if you did use a heavy/double cream you may have had the heat too high. I’m not sure what country you’re commenting from, but here in the UK some people mix up cream with Elmlea double cream alternative which is made up from buttermilk and oils. This will most likely curdle! My family gobbles this up every time! Thank you! Im ganno try it with coconutmilk as my husband cannot do the cream thing. I added mushrooms and served over mixed wild/white rice. My husband loved it! I’m allergic to spinach, what else would you recommend? OMG This was delicious! I just started the keto diet and have been looking for some low-carb recipes. This one is going in rotation! Instead of pasta, I just served it with steamed broccoli and it turned out great! 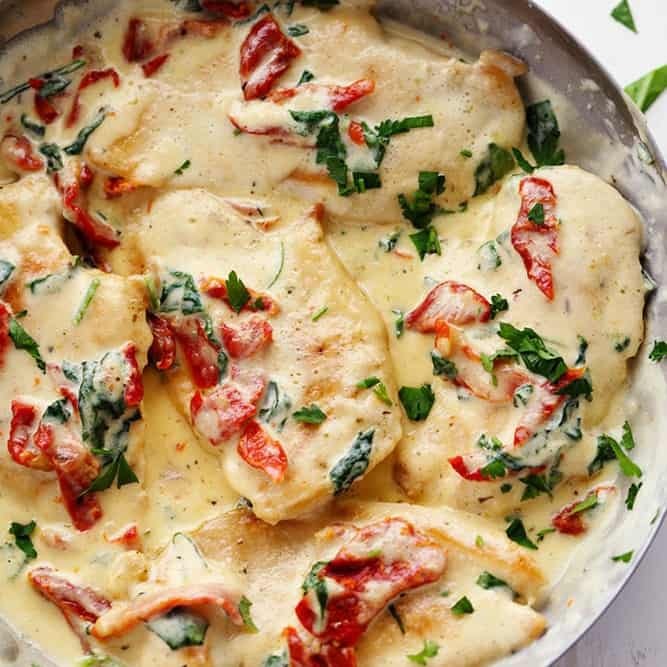 Creamy Tuscan Garlic Chicken was absolutely awesome!!!!!!!!!!!! My husband and I both are head over heels in love with this recipe. Can I get the nutritional information for your “creamy Tuscan garlic chicken”? This was a wonderful recipe! Its very easy to follow and your instructions were so clear! Thank you. It was also very easy to add things. The second time I made it I ended up adding onions and mushrooms to the dish and also just used fresh tomatoes instead of sundried tomatoes. I=The sauce is delish! It taste like an Alfredo sauce but better! I will have to come on your website more often. I even gave some to my golden retriever and husky, they approved! Thanks! Great recipe my kids love it super easy to make! This recipe is fantastic. I served it with zucchini spirals and even my grandchildren loved it! How awesome to have a low carb dish the whole family enjoys. 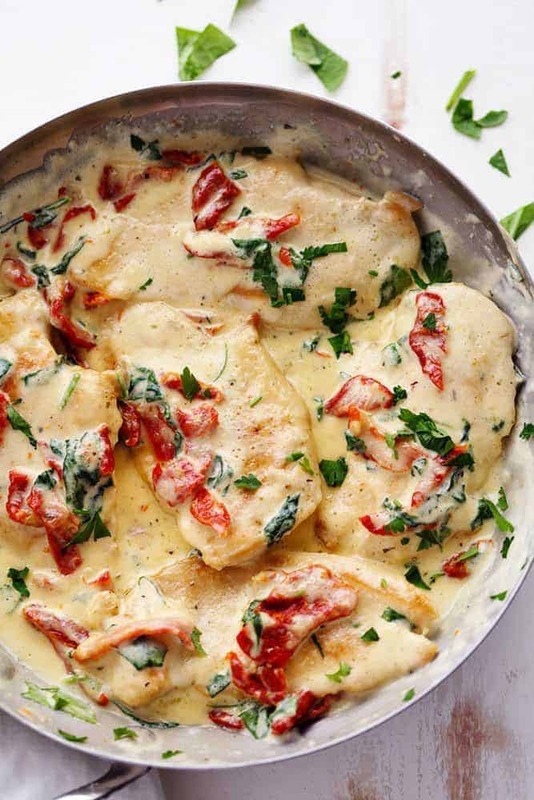 The creamy Tuscan garlic chicken was amazing! Thank you for sharing your recipe! Made for dinner tonight & was DELISH!!! No left overs!!! To be “healthy” I made brown rice. Still yummy! Will definitely make again, but thinking of trying it w/mashed potatoes! I think I’m going to try this recipe for a special night in this weekend. My only concern is with cooking the chicken with no seasoning prior to adding it to the sauce. I’m worried a bite of chicken with just the sauce may taste a little bland. Any recommendations, suggestions, or comments regarding this? So amazing!! Kids and hubby ate it right up. Kids had regular pasta and I had 0 carb nupasta and so delicious! Will definitely make again. I made this Keto friendly by serving it on riced cauliflower. Yummmmm…. My family loved it. Love this, I do add fresh mushrooms to the recipe!! It’s always a hit is my house, especially with a side of cauliflower potatoes !!! This looks pretty keto friendly… do we have a nutrition count? I made this for dinner last night. My husband who doesn’t normally like tomatoes said it was really good and worth making again. I cooked the sauce for a little longer and added slightly more cheese to help thicken. The seasonings as written were spot-on for us. I don’t see the nutritional values. I am doing strict Keto and need that information in order to log. 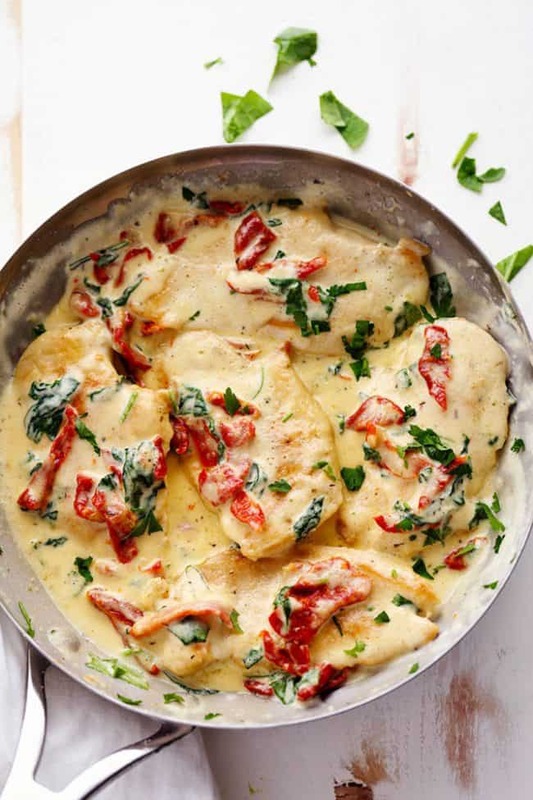 Love this chicken recipe ?? In the receipe it says to slice the chicken but in the pictures it shows the whole chicken breasts so which is best? Yes, I like to use a butterfly cut with this chicken. Cook chicken as directed remove; then garlic for 30+ seconds. Then add 1/3 cup of dry vermouth and cook till thickened and syrup like. Then add remaining ingredients and follow recipe as directed. The dish was delicious and so very legal on my weight loss program. Thank you. Could you please provide a nutritional breakdown on this? I’m required to record that information. Thank you for this yummy recipe. I used low fat cream and did not use the tomato. My husband not too crazy on sundrie tomatoes. I used a lot of spinach and green peas. Very tasty, I’ve never cooked with sun dried tomatoes before so was unsure how I’d like them but they were delicious….the only change I made was I salted and peppered the chicken prior to cooking and added a few cloves of minced garlic along with the garlic powder as I love garlic…I served with “zoodles” as I follow a keto diet….I’d definitely make this again ? This is one of our favorites. Everyone we make it for is just as disappointed as we are that there’s never enough. Fantastic! Excellent. I made this for friends last night, they practically licked their plates clean. Followed the recipe as written. 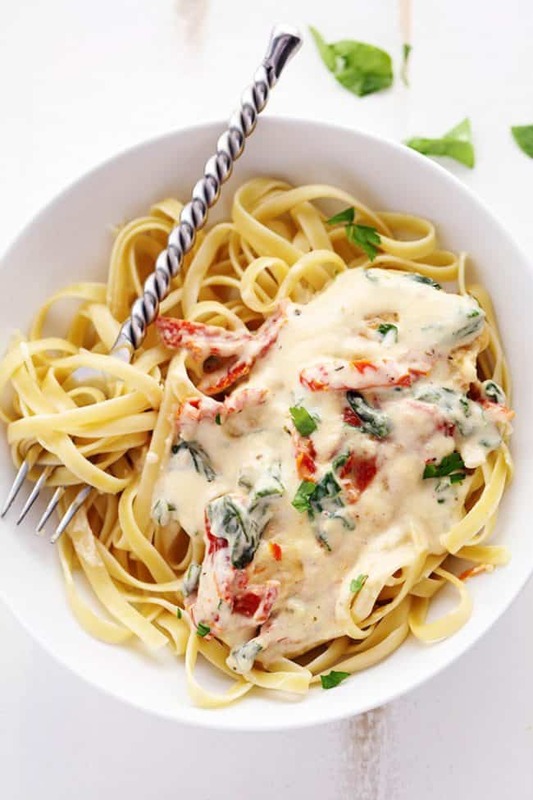 LOVE this recipe, omitted sun dried tomatoes and used roasted red peppers. My daughter has now made this recipe several times. I’ve had it twice and it is my new FAVORITE Italian pasta dish. Thank you for sharing. I know a lot of people say the following for something they really enjoy, which is, “if able, I’d give more stars than 5. 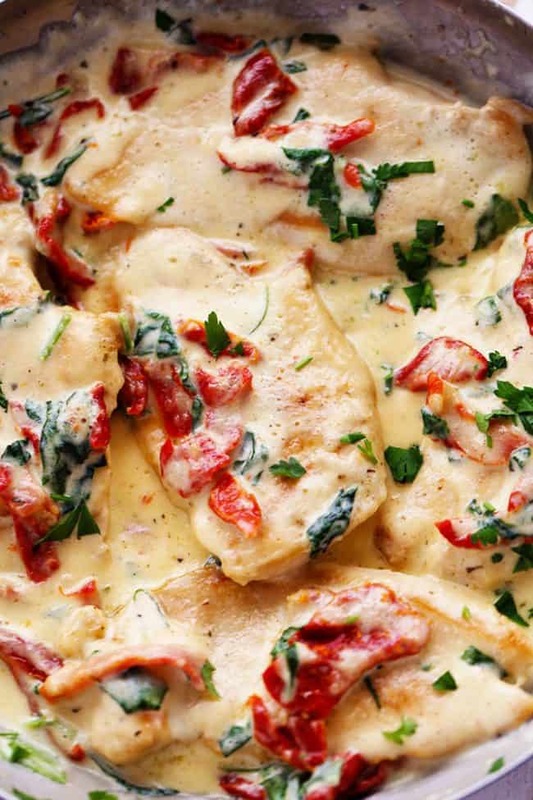 This Creamy Tuscan Garlic Chicken looks so deliciously amazing, Alyssa! We did not include the sun dried tomatoes when we made ours recently because we ran out of the ingredient. Ours ended up tasting delicious but we reckon it would be more yummy when we got all the ingredients right. Cannot wait to remake this recipe again soon! Will be making this tomorrow night. Read through the comments and suggestions. Going to add mushrooms and use fresh tomatoes as I’m not much of a fan of sundried. Will also use some freshly grated nutmeg as this goes well w/ cream sauces and spinach. I made this and my husband said this is his favorite dish I have made yet and he is picky. I can’t wait to make it again.